The drive. The tunnel of trees. Carmel (California) in Michigan. Michigan's #1 scenic drive. It's M-119, the Tunnel of Trees scenic drive from Harbor Springs to Cross Village. And THE color tour drive to take in the fall. Often written about, this nearly 20+ mile drive is not to be missed any season of the year. In the spring, you'll pass miles and miles of trillium that form a carpet of white in the forest. Winter brings vistas of the frozen water. Summer offers spectacular views of Lake Michigan and Beaver Island. But fall, well, this is the season when this drive truly shows off its colors. The changing hues of the hardwoods are a brilliant canopy. The winding road often has you looking into a vivid stand of trees and the leaves gently fall as you pass by. There is nothing quite like this route anywhere. 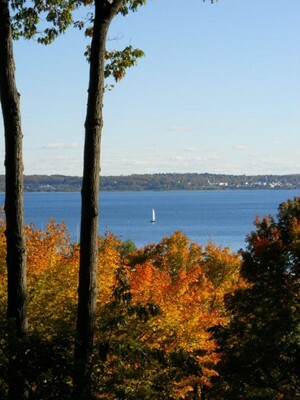 Begin your fall foliage color tour of M-119 in downtown Harbor Springs. Have a bite to eat or wander through the shops before heading north to Cross Village. First, you'll pass along bluff view houses and then admire the golfing skills of those chasing the white ball at the Harbor Point Golf Course. Soon you'll approach the turn off to Lower Shore Drive. Just a mile or so down this road is Thorne Swift Nature Preserve, a spectacular piece of property complete with trails and a pristine beach. If you continue down Lower Shore, you'll pass by houses and beautiful stretches of beach before exiting back out onto M-119 at the bottom of Angel grade. If you've stayed on M-119 instead of looping through Lower Shore Drive, you'll see the Birchwood Inn and then the properties of Birchwood Country Club. Birchwood is the last "civilization" you'll encounter until you come to Good Hart, about seven miles away. The road curves ahead of you making turn after turn--with some hairpin turns destined to make you drive skillfully! Good Hart is a small community of just a few buildings. It's a good stopping point for travelers and bicyclists and the Good Hart General Store is fun to explore. From Good Hart to Cross Village, the road is narrow and winding and truly deserving of its name, "The Tunnel of Trees." The blazing colors of the trees above you cover the road with random streaks of sunlight rapidly shooting through like laser beams. Once you've reached Cross Village, you have several tour choices. Turn around and head back on M-119 and you'll be surprised at what you missed along the way. 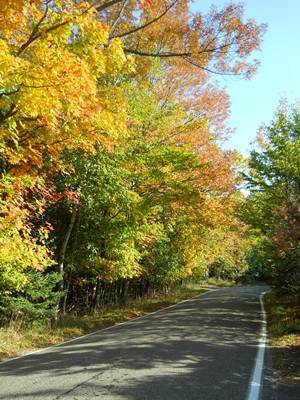 Head south on State Road and take the "over land" route back to Harbor Springs across rolling farm lands filled with fall color. Or continue north to Mackinaw City and pass by Sturgeon Bay, a stunning beach area complete with dunes, Wilderness State Park and McGulpin Point Lighthouse. Fall is not complete in Northern Michigan without a trip along M-119. Take this road north through the trees and you'll know why this route is often named the best drive in Michigan!